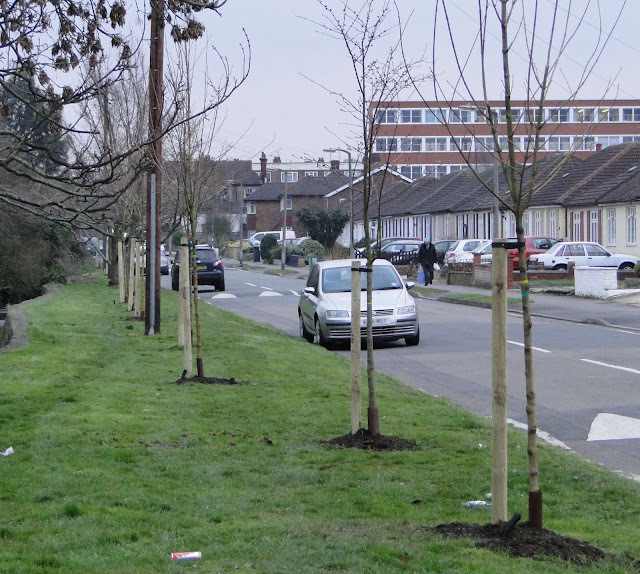 Some blog readers may have noticed some new trees planted along Trafalgar Ave. The Worcester Park Blog can reveal that these are the ‘Trafalgar 10’ and are the result of another project which received funding (£2530 in this case) from last year’s participatory budgeting event. This idea was proposed by the Worcester Park Residents’ Association who wanted to improve the appearance of this entrance to Worcester Park and give a boost to the local people in this area. It was voted through by assembled local residents from the three council wards: Worcester Park, Nonsuch and Stonecot. The trees were planted a little over a week ago and comprise of alternating Cherry trees and Maple trees – 5 of each.